by the North American Grappling Association! One Dragon Martial Arts distinguishes its coaches, instructors, and teaching staff solely as a means to assure the quality, integrity, ability, and solid working ethics of those who may legally represent ODMA. Only those ODMA athletes listed below are granted the right to use our registered name. Marcel Gonzalez: Brazilian Jiu-Jitsu Black Belt. 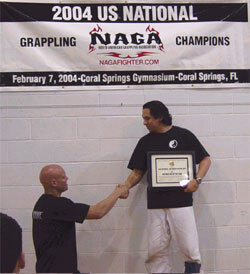 Pete “Pappy” Carrodo: Brazilian Jiu-Jitsu Blue Belt, ODMA Black Belt, ISR Matrix Instructor. A colored flag next to an instructor's name indicates that instructor's rank in Brazilian Jiu-Jitsu.